I'm from Bulgaria, but currently living in Brno. Saw a license plate sigh on a lovely 1.9 Rallye with the site address and decided to check it out. I'm pleasantly surprised, that 205 have a great fan base! Let me introduce my self. I'm a member of Bulgarian Peugeot club since 2004. 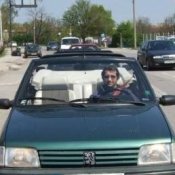 In the moment I own four 205s - 1992 Gentry, 1992 Roland Garros cabriolet, 1991 Look with white leather interior and 1991 Green (it will go to spare parts). I also owned another 1991 Roland Garros, but I disassembled it for parts. I don't know if the pictures are visible, that's why I'm posting the links also. Hi Ivan, welcome in Czech and mainly in our 205 club. I have checked your pictures and can say your links are working correctly. Wish you a good luck with your 205s, as it is a real pleasure to drive them. If you are interested in, you can settle your car profile here http://forum.205gti.org/viewforum.php?f=10 so we can appreciate your work. Feel free to use english, it's far more better then translating into Czech via google translator. Have a nice day. Ondrej. Thanks for the warm welcoming, guys! I will make a posting in the owners subforum and I'll present my cars in greater details. I have to collect pictures from here and there, because currently I can make photos only of the Gentry. Sorry but I don't know about any member in Brno with this version of 205. 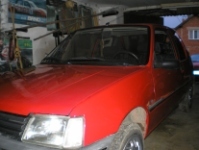 There was one, but his car got stolen and I doubt that it is still in Brno...it could be someone who is not very active here on the forum, neither during the meetings.